So it Begins...This will begin my first post of many. This is what has been going on around my home this last week. I have created a half work space, half clothing closet for my Son. Hopefully this will help keep the little messes in one place. I began with this a Turquoise blue not very functional closet, I didn't get a shot of the closet with the shelf up, but you can see what was there. When I started the Closet early in the week, I had not purchased this desk below. I just had the idea of what I had wanted. A couple days later, I was out treasure hunting for the Store" LL", when I came across this wood painted table for $10.00, what a bargain. I knew it had great potential and I could not have found it at a better time. So this green beast came home with me. As soon as I got it home, i pulled out the tools. I trimmed off the right side with a jig "quick and easy". I then proceeded to give it a light sanding. I didn't want to over do it, since I was going to use milk paint. I gave it two coats of General Finishes Millstone Milk Paint. Then a coat of Blue paint. I gave it a light brush coating in a gingham pattern to give the look of jean and yes I was doing this indoors, it was a hot week 100's. Oh and please ignore the ugly light Grey carpet it was here when we purchased the home, it will get removed eventually. 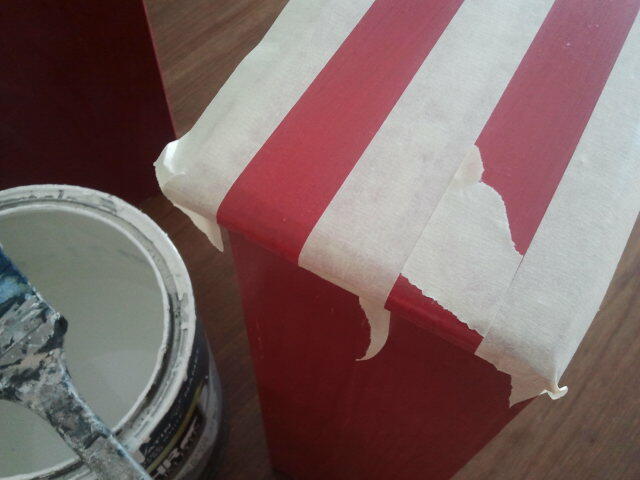 I pulled the tape off as soon as i finished painting, to prevent bleed threw. 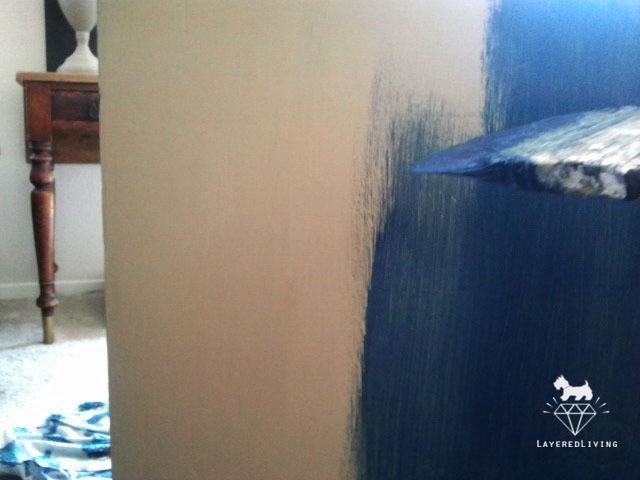 The Two top blue drawers were given 2 coats of Blue to achieve a deeper Blue. 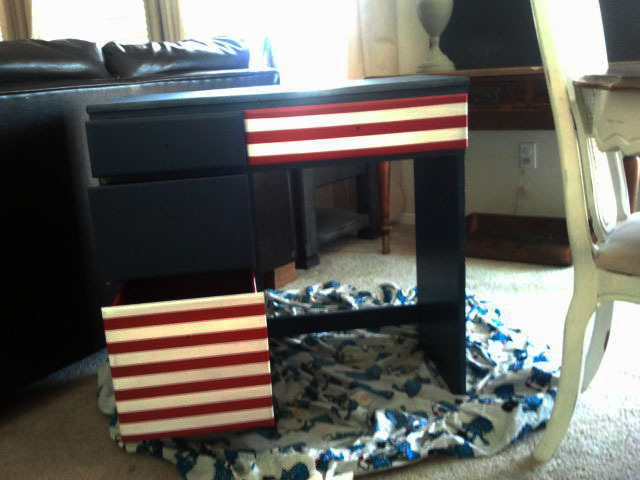 I lightly brushed millstone milk paint across the flag stripes and blue drawers to give an aged look. I then added a light coat of wood stain to the edges to give it a deep aged look. For the stars I found some of my sons crafts stars, traced them with a pencil and colored them in with a sharpie paint pen. 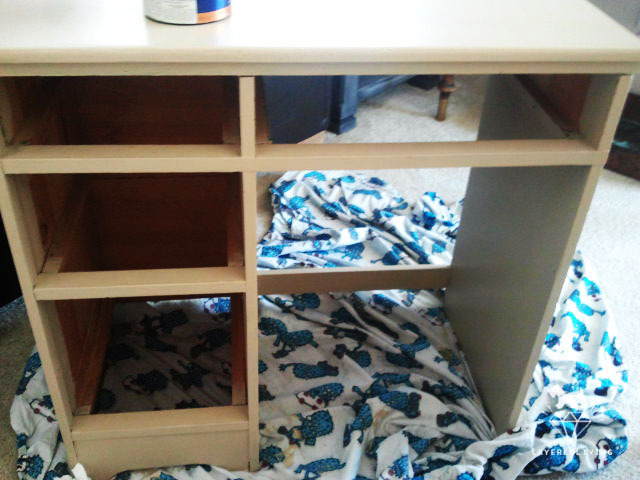 When all was completed I clear coated the entire desk with clear gloss spray paint. Some areas bubbled and created a crackle affect, which I was ok with, because i wanted the flag to look aged. I'm guessing this happened because I did not let the bottom paint cure long enough. Anyhow I'm Happy results and my little guy loves his new space.